How much should I donate for my booking? What are the terms and conditions for booking the garden? Do I need to undertake a risk assessment? Can I book the garden on weekends? How long can I book the garden for? Can I use the wood stove in the cabin, the cob/tandoor ovens, or the bbq area? Can I use the electricity to plug in electrical items? How do I access the garden for my booking? The garden project is a tiny charity and run entirely by volunteers. Donations for bookings are vital to enable us to keep the garden open throughout the year, and to continue to develop the resources for the benefits of all users. People generally donate a minimum of between £12.50-£25 per hour. We ask people to donate based on their circumstances and the number of people they will have at the garden. Further information on what the donation covers can be found on page 2 of the booking form. The garden accepts provisional bookings, but bookings will only be confirmed once we have received a signed booking form and the full donation for the period of the booking. A full list of terms and conditions are included in the ‘Guide to using the garden’. Yes, the person placing the booking should undertake a risk assessment prior to the booking. An example risk assessment can be found on the resources page of this website under the Booking and Using the Garden section. The garden available for booking during weekdays and evenings, and on weekends after 5pm. For weekends between March and October, and the hours of 11am to 5pm, the garden needs to remain open to the public. c)	That the person booking is in effect the 'guardian' during the booking period. •	Recording how many visitors beyond your own group have visited the garden, and responding to enquiries from public visitors. These simply entail writing down enquiries from visitors and listing the numbers of visitors in the garden’s Visitors book. This can be found in the wicker basket in the cabin. The coordinator or trustees will collect this information and follow up as appropriate. In effect, you will need to ensure you have someone who is 'garden guardian' and undertakes this role for the duration of your booking. •	Closing up the site at the end of your booking: ensuring the sand pit cover has been put back on, cabin doors securely shut, gates locked and key returned. If you are happy to book the garden for your event on this understanding, then we would be pleased to receive your booking. The garden can be book for as little as 1 hour, up to a full day. Your booking should include enough time for setting and packing up, as well as for tidying up, removing all wastes, etc. If you wish to run a workshop spanning over a period of days, or wish to book the garden on a regular basis (i.e. weekly, fortnightly, monthly), this can be arranged. 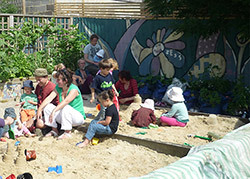 Please contact the Coordinator to discuss your ideas on barrackslanegarden@yahoo.co.uk. You are welcome to use the wood stove in the cabin, as well as the Cob & Tandoor ovens and BBQ are, but you must supply your own wood. At the end of the booking, the wood stove/Cob & Tandoor ovens and barbeque areas should be cleaned up and all waste/rubbish taken away with you for disposal. Note that ash from the fires should not be added to the compost bin but included with the waste you take away. Start off with the dry paper and kindling. Light this, and once it has got going, add the first log. You can control how much air goes into the stove with the air vent at the front. Add further logs as needed. At the end of the booking, ensure that the fire is completely out and clear up (sweep out the fire and around the stove area). Please take your rubbish home with you, as the garden does not have any waste collection facilities. *Please do not use green wood or wood that isn't completely dry. The garden is in a smoke-controlled area and green wood will both cause problems with resins building up in the flue and cause smoke problems for our neighbours. The garden was set up as a sustainable project and we take pride in being different. For an evening booking, you may turn on the lights in the cabin (and turn them off again at the end of the booking) free of charge. For the use of any other use of electricity (i.e. plugging in something), if agreed, the garden would expect an additional donation to cover this cost. This must be agreed in writing prior to confirmation of a booking. The garden is an alcohol and drug-free zone and these must not consumed on site. The garden does not have any waste collection facilities. All waste (both recycled and landfill items) should be collected and taken with you when the booking is complete. Your booking should include enough time to set/pack up and tidy up. Arrangements for picking up a key for access will be made once a booking as been confirmed.